In the past two weeks, the Peninsula Humane Society & SPCA (PHS/SPCA) has taken in more than 30 emaciated and hypothermic Brown Pelicans in need of urgent care. The pelicans have become grounded in San Mateo County and along the entire California coast this month. PHS/SPCA staff wildlife experts have used space heaters, cage dryers and heat lamps to keep the birds warm and have also given IV fluids, temperature checks, and tube feedings several times each day. Some of the birds have required hourly checks in PHS/SPCA's ICU unit for days until stable enough for transfer to the pelican room. The Staff is using every last resource to get the birds examined, warmed, medicated, hydrated and fed. This has included extra help from trained volunteers, who are not only helping with the pelicans, but enabling staff to keep up with care and treatments for more than 200 other sick, injured or orphaned wildlife in our care. PHS/SPCA staff hope to make the birds healthy enough so they can be released or transferred to another facility -- and this may happen for some within the next week -- but they also recognize that some will not make it, despite our care. 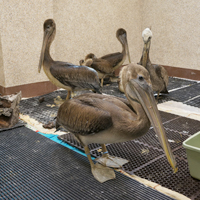 All the pelicans are being cared for in PHS/SPCA's state-of-the-art wildlife facilities at the Center for Compassion, 1450 Rollins Rd., Burlingame. The weakened conditions of these amazingly large birds meant that many were originally covered with a form of lice: and, yes, our staff and volunteers had to deal with that as well, along with the overwhelming smell of fish. The work is not necessarily clean or pleasant, but we all are grateful for the opportunity to help. Wildlife experts, statewide, believe these young or fledgling Brown Pelicans migrating up the coast are starving because their primary food source, various types of fish, has been depleted. Brown Pelicans feed by diving into the water. The fledgling pelicans less skilled at finding fish than adult pelicans are taking the brunt of this circumstance. "PHS/SPCA is providing food and monitoring the weights of these birds and will release them back in areas where adults are thriving so they can have a second chance," said Patrick Hogan, PHS/SPCA Wildlife Supervisor. In a typical year, PHS/SPCA may see 20-25 pelicans, but not in a concentrated time frame. I have to say that standing in the room with these remarkable and very large birds feels a bit like sharing space with a flock of Pterodactyl. Brown Pelicans are approximately 42-54 inches in length, they have a wingspan of six to eight feet and weigh between six and 12 pounds. The Brown Pelican is easily identified due to its size and very long bill with a gular pouch on the bottom. Brown Pelicans were an endangered species, but their populations have recovered due to protection received from the Endangered Species Act. As successful breeding continues, large numbers of the fledgling pelicans are coming into wildlife rescue centers up and down the coast. If local residents see a young pelican in distress, they should call 650/340-7022. Signs of stress include approachability (they don't fly away when humans approach them); lying down (especially with their head tucked in their back; overly aggressive (especially with people fishing); and stumbling, falling over and not being able to hold their head upright. PHS/SPCA provides care for all species of animals -- dogs, cats, rabbits, guinea pigs, parrots and other nontraditional pets, and also cares for sick, injured and orphaned wildlife from San Francisco through northern Santa Clara County. This work is made possible by donations.